Georges Roesch was the gifted, but perhaps now under-recognised, engineering design genius behind Talbot cars for the key ten years from 1925. 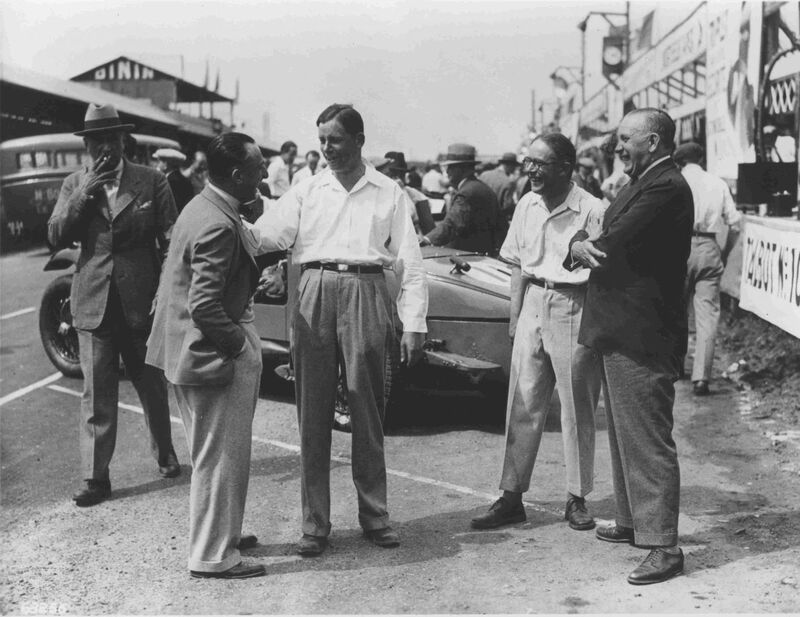 During that time, Roesch was responsible for a series of technical innovations that propelled Talbot cars to the forefront of automotive design in the late 20’s and 30’s. This appreciation of his life was written by Anthony Blight, author of ‘Georges Roesch and the Invincible Talbot’ and originally appeared in the Autocar. The life of Georges Roesch, who died last week, spans the whole history of the motor car, to which he dedicated himself with a passionate single-mindedness. Born in Geneva in 1891, he was in Paris by the age of 18, working his way through the motor industry from the bottom to the top. In 1914 he came to England, and two years later was appointed Chief Engineer to Clement Talbot Ltd, in London, where he made his permanent home. He had to wait until 1925 for the opportunity to create a new Talbot, immediately showing himself to be an engineer of genius with an artistic insight into the nature of mechanical things. He had a refreshing obsession with first principles which brought him both outstanding efficiency and commercial profitability from an incredibly simple design. By 1931 his sturdy pushrod engines had broken entirely new ground and were running on compression ratios of 10:1 at speeds up to 5,000 rpm, carrying his Talbots quietly through an unbroken chain of success in international motor racing with a reliability hardly equalled since. His engine perfected for a generation ahead, he turned to the chassis. By 1932 thetransmission of his cars was semi-automatic; two years later it was on the verge of two pedal control, and a totally new Talbot with backbone frame and all-independent suspension was under construction. It was never completed; in February 1935 the moribund partners of the thriving Talbot firm collapsed, its assets passed to the Rootes Group, and the most progressive range of cars in the country was put out of production. Roesch never recovered from the blow, and within five more years had left the industry for ever. It was, alas, his own unique combination of talents which betrayed him. His brilliant brain made him a perfectionist, intolerant of the least incompetence, incapable of compromise - a tyrant in pursuit of his ideals. These qualities produced wonderful results in the world of machinery - but in the grey muddy world of men they set him apart from all his fellows; at heart he remained a stolid Swiss black-smith's son with all the inspiring virtues of honesty, directness, thrift, shrewdness and industry. Yet he could also be depressingly suspicious, devious, obdurate, even perverse - frequently the despair of his colleagues and friends, who knew him as a gay, charming companion and generous host in his home. His genius could only flower so long as he was absolutely free, and in undisputed control - as he was at Talbot, where the man and his work became indistinguishable; but once the changing structure of the motor industry precluded the exercise of power on these terms, there could no longer be any place in it for Georges Roesch. He was the father of the modern production car engine and he could have been the father of the entire modern motor car. As it was, nearly all his pioneering work went to waste, causing him endless pain as he witnessed so many of his 20 and 30-year-old inventions creeping back into the country which he loved, from competitors overseas who had made better use of them. In the end, this pain burned deep and turned to bitterness; but through it all, Georges Roesch remained what he had always been - a dedicated motor engineer, as keenly interested as ever in the trend of future design, without a breath of sentimentality over the past, a warm-hearted friend, as straight and unbending as a die. It was not he who had changed, but the world around him - the world which he had once dominated like a giant, but which he came to feel had abandoned and forgotten him. Perhaps now that he has gone we can at last grant him the recognition he deserves, as one of the greatest designers who has ever graced this country. Letters from the Autocar shortly after Anthony Blight's tribute to Georges Roesch. THE INSIGHT and sympathy implicit in Anthony Blight's fine tribute to Georges Roesch (AUTOCAR. 20th November) must have touched the hearts of Georges' many old friends and admirers. One of the great individualists and innovators of the 1920s, it was by devoting personal attention to every detail of design, development and manufacture that he achieved his greatest successes; he could never have accepted the delegation of responsibilities, the design compromises and committee work that are the penalties that go with size. I first met him at the old Talbot works in Barlby Road, W10 some 43 years ago and vividly remember his burning enthusiasm for his remarkable high-speed push- rod engine which was so in advance of the times. Much later, Georges told me that the 14-45 Talbot of those days, which established his reputation, was expressly designed for economical production in quantities but through inadequacies in management and resources the sales potential of that remarkable car was never properly exploited. The frustrations and disappointments which Georges Roesch endured after leaving the motor industry in middle age have a parallel in the career of the great Dr. F.W. Lanchester. It was also his fate to watch other men rediscover many of his early inventions and to find himself the spectator of an indifferent and changing motor industry. Sir Harry Ricardo's appreciation of Lanchester (written for the Royal Society after his death in 1946) is equally true of Georges Roesch: "Whatever problem he tackled, he tackled always from first principles, for he refused to be influenced by fashion or by the beliefs of others, unless they accorded with his own experience or common sense". YOUR paragraph on the excellent Georges Roesch brought to mind the years 1933 to 1956 during which I enjoyed the delights of one 10/23 and three 14s from Barlby Road. It would require a volume to list his pioneer approach to the motor car. As I did all my own maintenance, I will cite only two, the very large, powerful and trouble free brakes and the early start (1927) to reduce the number of greasing points. Of course, there were some problems: I have heard the engines described as fiendishly difficult to work on and yet I had all of the engines of my cars out. However, I know of no other car in which, in order to replace the timing wheel (which was not infrequent) the first thing to remove was the rear petrol tank. To those not familiar with the 14/45 and 65, this may sound queer but it was a fact. The wonderful "ride" that it gave one made it worth the effort, even in 1956. Although Georges Roesch may have left the car industry in 1940, I understood that he later was active in gas-turbine development. How sad it is to realise that no more will we see the occasional letter in the magazine from the genius who produced 'The Invincible Talbot'. Petts Wood, Kent. W. F. Harms.